Nowadays, there are a number of ways to get your hands on your favorite books. That wasn’t always the case. In the past, you actually had to walk into a brick and mortar store to purchase new books. However, with the advent of online shopping, walking down cozy book filled aisles and attending live signings has become a rare act for many readers. While online shopping has pulled customers out of physical bookstores, it has also created new possibilities that could never have existed otherwise. In the virtual world of Second Life, a whole community of people and shops exist, establishing a unique society that mirrors real life in many ways. No matter where you are, people can come together to meet, talk, socialize, and shop. One such virtual bookshop in Second Life is Jackson Street Books, an independent bookstore that looks and operates like a “real life” store. Jackson Street Books not only sells books, but also hosts live author events, bringing authors and fans together without worrying about borders, oceans, or time zones. Tammy Domike, founder of Jackson Street Books, shares her bookselling experiences in both Real Life and the virtual world of Second Life. As an independent bookseller, what made you decide to open a virtual world bookstore in Second Life? 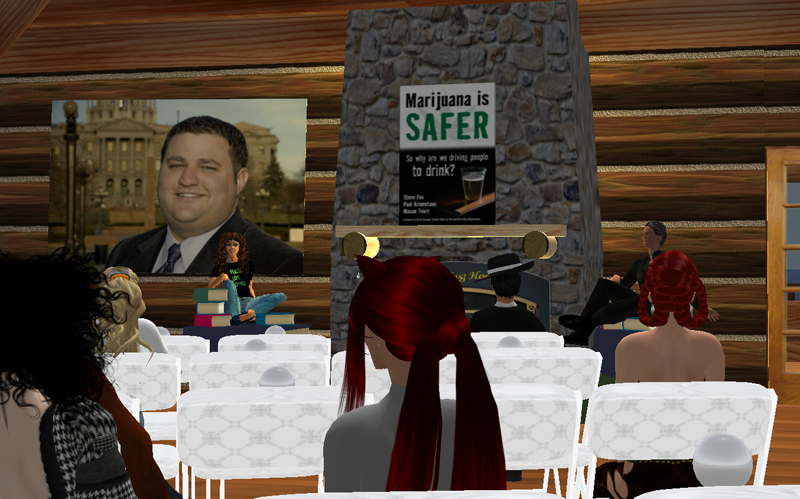 We had been involved in political groups in Second Life (SL) and I had attended author events such as the Virtually Speaking series. 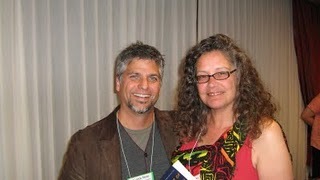 I realized SL would be a way to continue to have discussions with authors, even though we had moved 110 miles away from Seattle. At first, I thought it would be a cool club house for us to hang out in, decorated just like a bookstore. Then, as I learned how to script objects, I was able to make book cover images become live links to our online sales catalog for orders. The concept of the virtual bookstore has evolved as I learned how to turn the store into an honest replication of a bookstore, not simply a “play/pretend” bookstore. Plus, in SL my bookstore is housed in a lovely Carnegie building. The rent on that building in real life would be out of reach of any bookstore. If readers or writers are interested in checking out Jackson Street Books or Second Life, what do they need to do? Is there a quick link to the bookstore? You can start at this link to my reading hall, Lacamas, and you’ll be directed to download the software of the viewer. Then, you have the fun part of picking an avatar name and getting your pixel person all dressed up. Our umbrella group, Cafe Wellstone consists of many helpful folks who will be glad to assist new folks to SL. Just ask in group chat, and someone will answer you. If people are looking to purchase books through Jackson Street Books’ virtual store, how does the purchase process or book selection differ from other online bookstores? 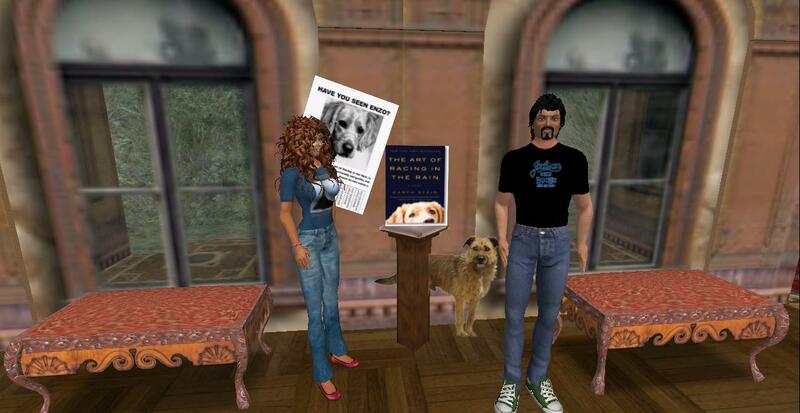 The books on our shelves feature author appearances in SL, or “virtually speaking” authors, but I also display books that we have in our real life (RL) bookstore. The SL links are to our inventory, and in RL you can also order from us at abe.com or biblio.com. The ordering process is the same as any other online order. The fun part is choosing which books I want to highlight, just as I choose what goes on my shelves in RL. What are some of the benefits and challenges of running a virtual world bookstore? You could say the benefits are the same as the challenges: being able to work with authors long distance, and the frustration of being long distance from the authors while you teach them how to operate SL. Of course, I do find it a joy and a delight when it all comes together. What advantage does a virtual world bookstore hold for authors and readers? In the current economy, publishers are really cutting back on author’s travel budgets, if they were even given one. SL venues give an author a global audience from the comfort of their own home. People who live in remote places that aren’t on the 9-city East Coast circuit have a chance to interact with an author, and chat with the real person, where as you might only have time for a quick hello in a RL autographing line. You’ve done author readings and appearances in Second Life. How does that work? We talk via a Skype connection, which allows your hands free for typing in text chat, although that is tricky while you are talking! I usually recommend authors ignore that until the second part of the hour. It can be intense multi-tasking when you are new. I have a helper or two in the audience who make sure I don’t miss any questions from the crowd. We can create podcasts of the audio, or even machinima videos of the virtual reading. What authors have Jackson Street Books hosted? Who is coming up? We’ve had some terrific folks, Garth Stein, Jess Walter, the Boilerplate creators; Paul Guinan and Anina Bennett, Jeffery Kaye, Keith Thompson, Mason Tivert, Alicia Morgan, and then the whole gang of Interfictions2 where I met you! That was especially fun as we had so many voices all in one hour. Do you have a favorite author event that you’ve done? If so, what was it about that event that you liked? Well, that would have to be the event that had no book attached. Our friend GottaLaff at The Political Carnival is an activist who introduced us to Lt Col Barry Wingard, a JAG lawyer, defending Fayiz al-Kandari who has been locked up in GITMO for 9 years without charges. He was joined by co-counsel Lt Cmdr Kevin Bogucki at a Town Hall in the Virtually Speaking studios. VS generously gave us an hour on blogspot radio and the podcast is available here. I’m very proud to have been able to do even a little part helping these great men seek justice for Fayiz. Do you have any advice for someone who wants to attend or hold a virtual world author event? Any lessons learned? Don’t be nervous, be ready to laugh at any mis-haps that may happen, breathe deep and have fun. An event can be tightly controlled, but no matter how much prep you think you’ve done, the technology will throw a monkey wrench at you when it’s least expected. Are there any new and exciting developments that Jackson Street Books has in store? Monday, Dec 27th, we’ll be talking to Ray Vukcevich about his new short story collection, Boarding Instructions. I had met an avatar named Ookami Moonbeam, who wanted to know about the bookstore. While I was showing him around, he told me he was actually Ray, and I told him I was actually the Tammy who met him at Seattle Mystery’s autographing party for The Man of Maybe Half A Dozen Faces a decade or so ago! Even in the pixel, its a small world. This entry was posted in Uncategorized and tagged Bookselling, E-book, Garth Stein, Jess Walter, Online shopping, Second Life, Virtual world. Bookmark the permalink.